Globally using a social network for pure business purposes, by you or your customers, chances are good that LinkedIn boasts more than 187 million users. It doesn’t matter whether you operate a multi-location business with a well-known name in your industry or work as a lone professional, a LinkedIn company page is an out-standing way to show a community of professionals what you can do. It is indeed an opportunity for zero cost advertising and showcasing ones’ capabilities and talents to the entire world. First you must sign up for a LinkedIn account. Don’t worry about upgrading to a paid account; you don’t need that to start a company page, or even to do most things a business should do on the social network. Choose a password that you’re comfortable handing out to employees or contractors if they maintain your company page, or change it if you already have a profile. 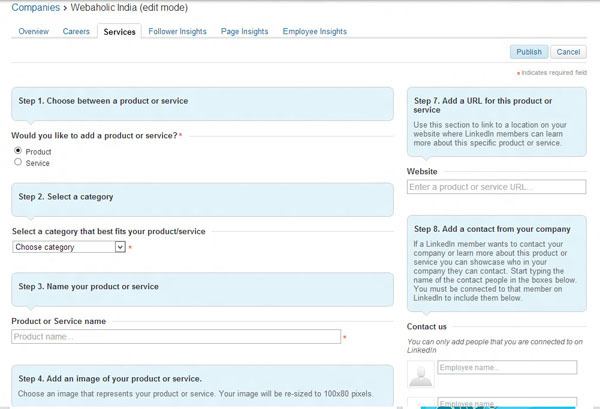 The first screen will be like this once you are creating a company page. After entering the name of the company and your email address, you’ll find yourself on the “Overview” page. To add data to this section, click the “Edit” button on the right side of the page. Here, you’ll enter your logo, your description, header image, and most important, your company specialties. If you really want to narrow the terms down, use the Google AdWords Keyword suggestion tool to find key phrases for your industry. Cutting and pasting your entire ‘About Us’ section from your website isn’t recommended if it’s worthy. On LinkedIn, if you can whittle the description down to one paragraph as Webaholic has done, you’ll speak to your busy LinkedIn audience. To improve your description even more, learn about buzzwords to avoid on LinkedIn entirely. If you don’t currently pay for a subscription to the Careers page, you’ll need to navigate through your Edit page by clicking on the blue box on the top right side of the page where it says “Edit”. Click on this, and suddenly your old tabs will appear again! From there, you can click Careers and post jobs at your company. You can add products and services to your company page under the “Services” tab, but you should add only your most popular items; you may want to send visitors to your website for a closer look. However, don’t ignore this tab entirely (as many companies on LinkedIn do), since it helps prospective clients find and understand your business. LinkedIn lets you add videos, name a company contact, and insert lots of other details. For example, you could call your service “Sales in Michigan,” and assign the responsible salesperson. The contact needs to have a LinkedIn profile to participate, so encourage your employees to sign up if they haven’t already. Once you’ve entered a product or service, ‘Recommend’ and ‘Share’ links appear beneath it. Ask loyal customers on LinkedIn if they won’t mind making a recommendation for your company, which will appear along with a link to their profile in the right-hand sidebar of your product or services page. The ‘Share’ button lets interested people share your products on LinkedIn or on Twitter if they have added their Twitter account to LinkedIn. Once you’ve created your company page, ask employees to go back and edit their profiles so that the new company page appears. They can do so by clicking Edit Profile and then clicking Edit beside their position at your company; once they start typing the name of the company, they can choose the company page. The benefit for you is that visitors to their profile will be able to click over to your company’s page. You can add employees responsible for a certain product or service solely from the “Services” tab. These are the only employees that visitors to your page will be able to view, unless they have your employees in their personal LinkedIn network. 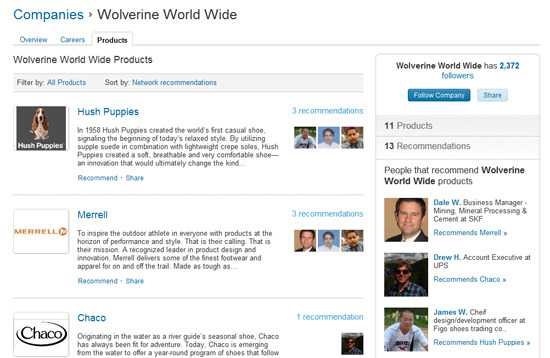 Wolverine’s products page is well done. You know how you can import your Twitter feed to post to your personal LinkedIn profile? You can’t do that with a company page. 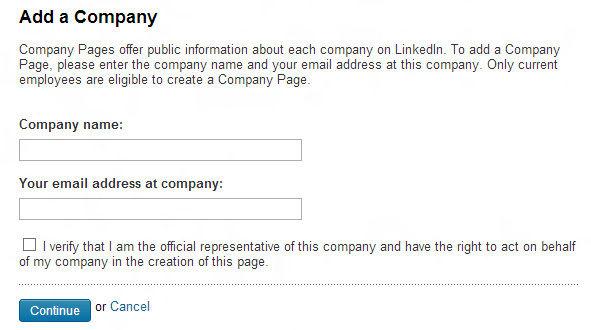 Only designated administrators can post on a company page from within LinkedIn. You’re also barred from updating a company LinkedIn page with Hootsuite unless you’re a Hootsuite Enterprise customer, so small to midsize businesses must log in and post directly to their page each time they want to share an update. Always try to find out who are your clients who are present over LinkedIn. The ones who have been associated with you since a decent period of time and are happy with your products and service you can always request them for a recommendation. This also helps you to solidify your company profile over LinkedIn. These are some of the very useful tips you can explore. If you happen to churn some thing more please do share it!